One-sentence summary: The memoir of a Haitian woman who grows up during Haiti's repressive Duvalier regime, becomes a successful gynecological surgeon, and finds her vocation as a healer by embracing her family's Voodoo heritage and her contemporary medical training. Do I like the cover? : It's fine -- very reminiscent of self-help-y style books. First line: To most people, the word "Voodoo" conjures up images of black magic rituals, dolls bristling with pins, sacrificed chickens (or people), and zombies rising from the grave. Buy, Borrow, or Avoid? : Borrow or buy for those who love memoirs, spiritual discussions, cultural studies, and armchair escape. Why did I get this book? : The title is delightfully provocative. I'm interested in non-Western medical practices and alternative healing methods and was immediately drawn to this book. Review: This was a fascinating, unexpected memoir. 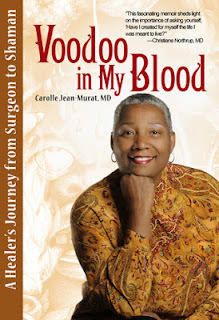 From the subtitle -- A Healer's Journey From Surgeon to Shaman -- I anticipated a kind of anthropological study of Haitian spirituality including Voodoo, and Dr. Jean-Murat's decision to embrace her family's faith practices. This memoir has all that, and more: it is a look at a woman and a country in turmoil and transition. Born in Haiti in the 1950s, Jean-Murat lived through some of her country's most violent times: the dictator "Papa Doc" Duvalier, followed by his son "Baby Doc". Jean-Murat's family was divided between the educated elite of Haiti -- her father's side of the family -- and the practitioners of the then-illegal Voodoo tradition -- her mother's side of the family. Growing up, Jean-Murat was embarrassed by her maternal relatives, as much as she loved them, and she gave up numerous opportunities out of fear of having to reveal her Voodoo connections. However, repeated experiences with Voodoo ceremonies resonated with her and always called to her, and as she trained to be a doctor, she found herself turning more and more to her family's faith to help her in her work and personal life. In her Foreword, Jena-Murat makes it clear that Voodoo is not some kind of black magic, and her book explains the rituals, beliefs, and spiritual grounding of the Voodoo tradition in Haiti. (In 2003, Voodoo was recognized as an official religion in Haiti, and her family's Voodoo temple became a national heritage site.) I so enjoyed this glimpse into a faith tradition that I know little about, and I loved reading Jean-Murat's journey to incorporate her faith into her medical practice (especially as her spiritual beliefs don't limit a woman's reproductive choices!). At about 345ish pages, Jean-Murat covers a great deal skillfully, and while at times I thought the narrative could have used a leeeetle tightening, I was always engrossed and interested in what she had to say. Her writing is straight-forward and clear, a mix of her own emotional introspection and constructed dialogue that made the book read quickly. It's obvious Jean-Murat loves Haiti and her family, and she invites the reader to find love in this place and her people as well -- as maddening as her family may be at times! -- and I enjoyed this look at a world unfamiliar to me. Jean-Murat's medical focus -- and vocation -- is healing those who've experienced sexual assault, and a great deal of this book discusses openly that trauma. Those who are easily triggered should be warned, but as with everything in her story, Jean-Murat handles those moments carefully and honestly. It was painful to read, but I appreciated their inclusion, and her honest discussion of this epidemic. My only wish was for a glossary, as Jean-Murat peppers her narrative with Haitian Kreyòl phrases; while she defined them at the time, I often forgot later what they meant and had to guess from context. Otherwise, I have no gripes: this was an engrossing and fascinating read, an armchair escape and a spiritual education. HA! That's awesome -- I know the feeling. As a rule, memoirs aren't quite my thing but something about the Haiti/Voodoo connection really grabbed me -- and in this case, the kneejerk response paid off! It's not everyone's thing, but those that are curious will get a good pay off too! I love reading memoirs every once in a while and this one sounds like it would be really interesting and definitely something different for me. Thanks for the great review! Oh, you have piqued my curiosity very sharply with this book, and though I am a liberal Christian, I am always looking into other voices and religions with an eye to understanding them, and what makes us similar and what makes us different. This sounds like an excellent book, and one that I am sure that I would love, based on your review. I can't help but notice that a lot of your books that are featured as your background exist on my shelves too. I think we are kind of reading twins, so I always take your recommendations seriously. Though some people are not open minded enough for a book like this, it is knowledge that fosters wisdom, and I seek to be wise by hearing other people's vastly different experiences. Great job with this review today! Your enthusiasm was palpable!! Heather, your comments always make me SO HAPPY. Thank you for your kind words!! This is a wonderful read to expand your interfaith awareness -- like I said to Anne and Sam, it hits the right notes in terms of drawing the reader in and making her beliefs and experiences resonant for someone who is unfamiliar with Voodoo -- and her obvious compassion for her patients translates into a kind of compassion to her readers -- she cares very much about helping the reader hold her story and appreciate her context that might challenge but also give the reader space to consider something that is often feared or portrayed negatively. I am tickled you think of us as reading twins -- I feel the same way, as you seem to love what I love! -- so I appreciate your taking this seriously -- this is one worth 'risking', I think -- really delightful. My husband finds voodoo really fascinating, as you say it's definitely not black magic. I'd love to learn more about it. Sam, this is a wonderful intro -- tied into Haitian history, the author's own familial connection, her return to this faith tradition -- she made it accessible and something I could relate to and appreciate -- and reading how it shaped her and her medical practice was very inspiring (in an era when I feel like we see so much about drs and pharmacists refusing to treat folks b/c of their faith, etc!). I love memoirs and while this is one I would have normally passed up, your review makes me want to find a copy and read it. Learning about faiths that are so different from my Christianity is always something interesting to me and I know next to nothing about Haitian history or Voodoo, other than what you might catch on television. And since my husband is a chiropractor, I am always interested in non-Western and alternative medical practices. I don't think there is only one form of medicine or one way of treating illness. Everything needs to work together. Terrific review. Holly, this so sounds like it'd be a great fit for you -- Jean-Murat's exploration of her faith is done really well and I was captivated by her discussion of Western medicine -- she writes honestly about how insurance companies and lawsuits have shaped the way doctors practice -- which was eye-opening and depressing! -- as well as the changes she made in how she healed others -- it makes me wish she was my doctor! Ooh--this one sounds fascinating! I've been craving more memoirs and nonfiction lately, and this one sounds so original.